Thanksgiving is a time for family, food, and a new pair of stretchy pants to make room for more food. For booster clubs, it’s another season to create a fun supporting activity for your organization with the help of your community. Booster.co has put together Booster Club Thanksgiving Fundraiser Ideas that are guaranteed to bring families and friends closer together all the while helping to raise funds to support your program. From apple to pecan to pumpkin, homemade pies are one a cornerstone of Thanksgiving. The many different shapes, sizes, and flavors always make coming back for seconds an easy choice. Encourage the best bakers in your community to take part in a booster club pie baking contest. It’s the perfect Thanksgiving fundraiser for booster clubs looking to entrap their members with a sweet treat while raising funds for their academic program. To start setting up a baking contest, first, have participants register ahead of time with an entry fee and any necessary information you might want from them. Make sure to set up a date/time in which the contest will start and pies will need to be present for judging. On the day of the contest, charge a small fee to those who are not making the pies but still want to take part in the festivities. Establish how the pies will be judged. Is it just on taste alone or on presentation as well? 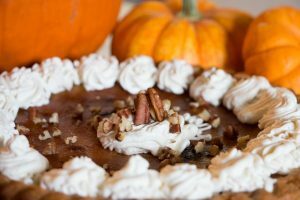 Originality and technique are additional judging options for your booster club Thanksgiving pie baking contest. Put together a tasting panel that will score each pie on a scale of one to ten. Since a single pie won’t feed every contest attendee, allow the audience to judge it based on looks and smell (optional). Once the judges make their decision, the winners get (possibly) donated prizes and the booster club then can auction off all of the pies in the contest. To help increase the funds raised at this event, have people bake additional pies and baked goods to sell at the event. The results, auction and sales money goes to the booster club, and owner of the priciest pie gets a prize and bragging rights! Another great Thanksgiving booster club fundraising idea is a pie eating contest. Any activity that includes indulging in personal favorites is bound to encourage a large and supportive community gathering. Like baking the pies, using this traditional crowd pleaser is a great way for your booster club to make money in the fall season. Setting up a pie eating contest is rather easy and straightforward, obtaining the pies being the main and most crucial step. 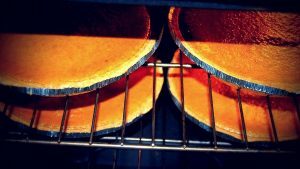 Ask booster volunteers or other known bakers in your area if they’d be willing to bake a few pies for the contest. Appeal to a local bakery for donated pies, and offer publicity for their business in your communications, pamphlets, and online event page if a larger amount of pies are needed. Depending on the number of people who want to take part, consider splitting the contestants up into different groups of five to ten that eat at different times. Charge a fee for both those who want to take part in the pie eating contest. Ask for a donation or charge other individuals who want to come, watch, and cheer on the contestants. Have other concessions (like pie to take home or hot cider) or activities for purchase available to make the event an all-day celebration. All the money can go to the booster club and the participant(s) that win can be offered a prize predetermined by the booster club. Well-organized 5k run/walks have been one of the best fundraisers for many non-profit organizations. They’re fairly easy for most clubs to set up, easy for individuals of all ages and abilities to take part in, and allow a sense of accomplishment and togetherness. It could be your most successful event of the year. Turn an ordinary marathon into the ideal Thanksgiving fundraiser for your booster club by hosting a holiday Turkey Trot! There are two ways to raise money with a 5k turkey trot: physically and virtually. In a physical Turkey Trot, your community members run/walk the distance in a mapped out route with family, friends, and other participants on an agreed upon date/time/location that your booster club hosts. 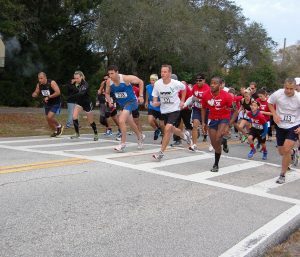 A virtual 5k takes place with an online fundraising platform. Virtual 5k’s ask participants to register to run a certain distance on their own. This is a great way to scale the impact of a physical event and give your supporters the option to participate no matter where they are. In order to keep everyone who partakes safe, consider a route that doesn’t get much traffic or has sidewalks to stay on or could be contained within a local park. Over time, big numbers might encourage your community to shut down certain areas specifically for your Thanksgiving booster club fundraiser. Ask for an entry fee upon registration with the possibility of a group discount for groups over a certain number. It’s also a great motivator to present finishers of the 5k a small token of thanks and congratulation on completing the marathon. Thanksgiving is about eating and celebrating with close friends and family, but it’s no secret that the fall season also means cheering on your favorite football team. 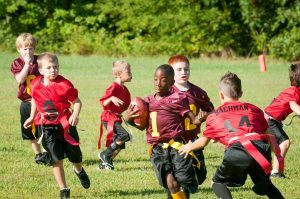 Use the love for football to create a family flag football or tap football event fundraising idea for your academic, music or athletic booster club. The best place for a family football game is, of course, a football field, but any space, like a gym, can be used in its place. Ask participants to start teams and recruit friends to take part in the festivities, registering who they plan on playing with and/or against. Rival teams can be requested beforehand or chosen on the day of the event depending on what your booster club chooses. Ask groups sign up, ask for a small entry fee for their participation and donations for fans and onlookers. Expand your event’s potential by creating multiple divisions for groups of supporters. For instance, participants can register for the competitive, casual, or kids division. All in all, there are several different ways that you can formulate a family football tournament for your booster club fundraiser. Simply give your players a place to play, a ball to throw, and some hot drinks to sip at halftime. It’s sure to be the game of the season! 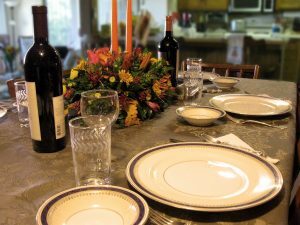 For many holidays hosts, the decorations on and around the table are just as important than the food. 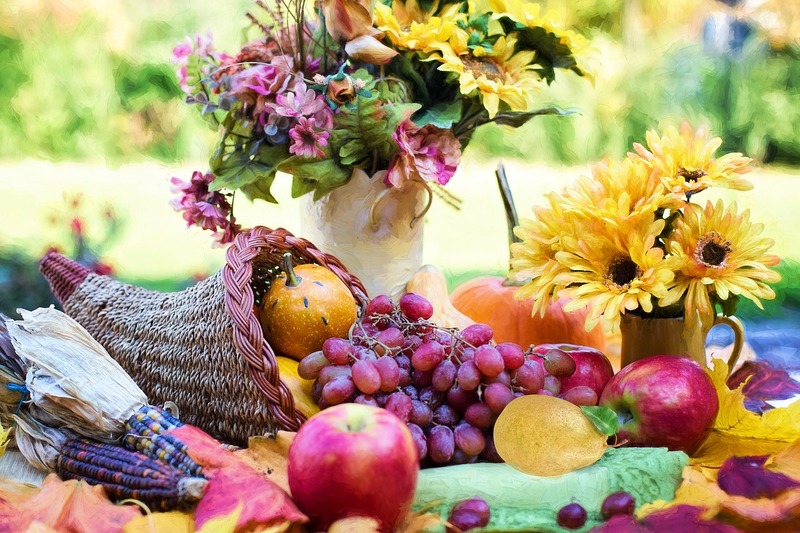 None is more important than the Thanksgiving centerpiece, which brings us to another one of our great booster club Thanksgiving fundraiser ideas. It’s the first thing friends, family, and party goers see when they step into the dining room and remember for many years if done right. Setting up a Thanksgiving Centerpiece Auction a very easy as all the work comes from the centerpiece creators. All the booster club has to do is create a signup form for future participants and charge a registration fee. After that, set up a date/time/location to host the event with tasty food and drink items as well as other fun activities. Charge another small fee for entry to those not making centerpieces but come for the fun of the auction. The money made from the auction can go to the academic booster club and the owner of the priciest Thanksgiving centerpiece wins a prize chosen by the staff. Keep in mind that combining multiple booster club fundraisers from several different booster club groups is a great way to serve a more diverse people in a single event. Creative booster club Thanksgiving fundraiser ideas take more than a moment to put together during an already busy time of year. With the help of volunteering friends and family, it’s a fun and heartwarming way to both spend time with loved ones, eat homemade goodies, and help ensure that your booster club continues to aid your school program year after year.